Here we are 3 weeks into 2015 and I thought it was time to look back at 2014. It was the year that I accomplished my goal of starting this blog in May 2014. I did it to be able to share my creative side. I was also lucky enough to be chosen as a Design Team member with Mountain Plains Crafters . I met that wonderful group of women through our love of Unity Stamp Company and their amazing stamps.The sisterhood that I have found through my card-making was what inspired me to make this card for this post. Made with a "vintage" Unity girlfriend stamp, a Unity sentiment and a cute envelope stamp whose origin I cannot remember, this card was such fun to make.. Hope you like it !! In the 7 months since I started Meticulosity, I have shown you Where I Create and how much I LOVE coffee. I have been in Bloghops and sponsored a Christmas in July Bloghop with Mountain Plains Crafters . I have shared my love of washi and also FLOW magazine. I was lucky enough to have a project on display at CHA this month. Made with fantastic Adornit products, it was a first for me. But I will definitely be making more wooden projects and also using the wonderful Art Play Paintables again by Lindasy Waltman-Ostrom. Mountain Plains Crafters and Adornit also recently hosted a joint bloghop. I also set a goal to do something creative every day in 2014. I made and posted 315 cards in an album on Facebook. Some days it was as simple as reading a creative magazine or stamping several images to color later. Even after a crazy shift at work, I could always find a few minutes to do something creative. All in all, I think it was a success !! For 2015, my creative goals are simple. Try a few new techniques. Make at least 1 Christmas card each week. Clean out my scrap drawers once a month and share my scraps with 2 others. Have more fun with Mountain Plains Crafters. 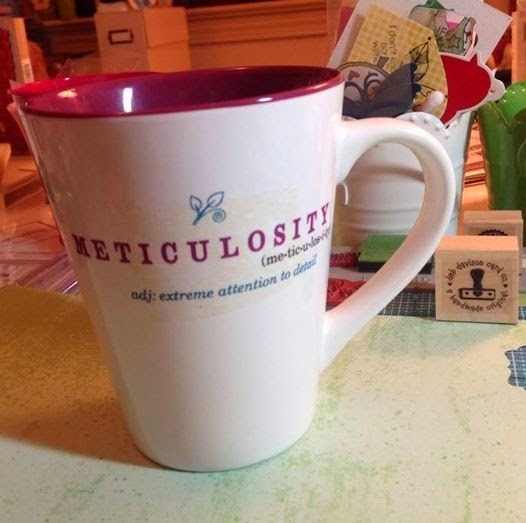 AND continue my creative journey here with Meticulosity. Thank you for joining me again.Your support has been amazing and always appreciated. Leave me a comment about something you would like me to write about, create, review or use. I will choose a random winner from the comments and send you some goodies to start your own creative journey in 2015 !! I'm so glad 2014 brought us together my friend! Great recap of your last year as a blogger and congrats on being featured at CHA! I always look forward to seeing your creativity. For the life of me, I can never figure out how you find the time to create as much as you do. Cute card. I would like to see the new techniques you try and a review of the products you use for those techniques. Congrats on meeting so many of your accomplishments and for having a project on display at CHA, that is awesome!